Damen Shipyards Group recently unveiled a new line of Trailing Suction Hopper Dredgers (TSHD). 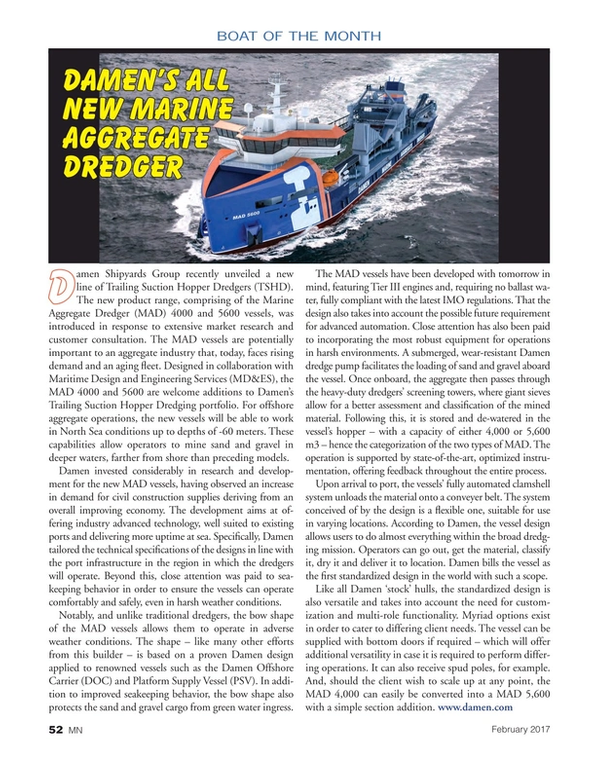 The new product range, comprising of the Marine Aggregate Dredger (MAD) 4000 and 5600 vessels, was introduced in response to extensive market research and customer consultation. The MAD vessels are potentially important to an aggregate industry that, today, faces rising demand and an aging fleet. Designed in collaboration with Maritime Design and Engineering Services (MD&ES), the MAD 4000 and 5600 are welcome additions to Damen’s Trailing Suction Hopper Dredging portfolio. For offshore aggregate operations, the new vessels will be able to work in North Sea conditions up to depths of -60 meters. These capabilities allow operators to mine sand and gravel in deeper waters, farther from shore than preceding models. Damen invested considerably in research and development for the new MAD vessels, having observed an increase in demand for civil construction supplies deriving from an overall improving economy. The development aims at offering industry advanced technology, well suited to existing ports and delivering more uptime at sea. Specifically, Damen tailored the technical specifications of the designs in line with the port infrastructure in the region in which the dredgers will operate. Beyond this, close attention was paid to seakeeping behavior in order to ensure the vessels can operate comfortably and safely, even in harsh weather conditions. Notably, and unlike traditional dredgers, the bow shape of the MAD vessels allows them to operate in adverse weather conditions. The shape – like many other efforts from this builder – is based on a proven Damen design applied to renowned vessels such as the Damen Offshore Carrier (DOC) and Platform Supply Vessel (PSV). In addition to improved seakeeping behavior, the bow shape also protects the sand and gravel cargo from green water ingress. The MAD vessels have been developed with tomorrow in mind, featuring Tier III engines and, requiring no ballast water, fully compliant with the latest IMO regulations. That the design also takes into account the possible future requirement for advanced automation. Close attention has also been paid to incorporating the most robust equipment for operations in harsh environments. A submerged, wear-resistant Damen dredge pump facilitates the loading of sand and gravel aboard the vessel. Once onboard, the aggregate then passes through the heavy-duty dredgers’ screening towers, where giant sieves allow for a better assessment and classification of the mined material. Following this, it is stored and de-watered in the vessel’s hopper – with a capacity of either 4,000 or 5,600 m3 – hence the categorization of the two types of MAD. The operation is supported by state-of-the-art, optimized instrumentation, offering feedback throughout the entire process. Upon arrival to port, the vessels’ fully automated clamshell system unloads the material onto a conveyer belt. The system conceived of by the design is a flexible one, suitable for use in varying locations. According to Damen, the vessel design allows users to do almost everything within the broad dredging mission. Operators can go out, get the material, classify it, dry it and deliver it to location. Damen bills the vessel as the first standardized design in the world with such a scope. Like all Damen ‘stock’ hulls, the standardized design is also versatile and takes into account the need for customization and multi-role functionality. Myriad options exist in order to cater to differing client needs. The vessel can be supplied with bottom doors if required – which will offer additional versatility in case it is required to perform differing operations. It can also receive spud poles, for example. And, should the client wish to scale up at any point, the MAD 4,000 can easily be converted into a MAD 5,600 with a simple section addition.